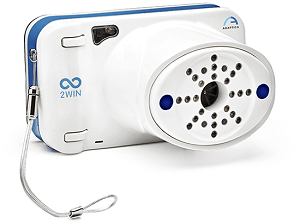 The 2WIN is a binocular hand held refractometer that measures both eyes at the same time, in real life vision conditions. It measures myopia, hyperopia, astigmatism and other amblyogenic factors. It also measures sight anomalies that may be related to anisometropia, anisocoria, strabismus, phoria. It provides an objective, not subjective, assessment of the binocular vision function. By providing all these parameters, the 2WIN functions as a vision analyzer, not just as a refractometer.